The Ptolemaic dynasty, also known as the Lagids or Lagidae, was a Macedonian Greek royal family who ruled over Egypt. Their rule lasted for 275 years, from 305 BC to 30 BC. They were the last dynasty of ancient Egypt. Ptolemy, was one of Alexander the Great's generals and deputies. He was appointed satrap of Egypt after Alexander's death in 323 BC. In 305 BC, he declared himself King Ptolemy I, later known as "Soter" (saviour). The Egyptians soon accepted the Ptolemies as the successors to the pharaohs of independent Egypt. Unlike their previous rulers under the Achaemenid Empire, they usually lived in Egypt. Ptolemy's family ruled Egypt until the Roman conquest of 30 BC. All the male rulers of the dynasty took the name Ptolemy. Ptolemaic queens, some of whom were the sisters of their husbands, were usually called Cleopatra, Arsinoe or Berenice. The most famous, was the last queen, Cleopatra VII. She was involved in the Roman political battles between Julius Caesar and Pompey, and later between Octavian and Mark Antony. Her death marked the end of Ptolemaic rule in Egypt. Dates in brackets represent the ruling dates of the Ptolemaic pharaohs. They often ruled jointly with their wives, who were often also their sisters. Several queens exercised royal authority, but the most famous and successful was Cleopatra VII (51–30 BC), with her two brothers and her son as successive nominal co-rulers. Several systems exist for numbering the later rulers; the one used here is the one most widely used by modern scholars. Ptolemy VIII Euergetes II (Physcon) (170–163 BC, 145–116 BC) married Cleopatra II then Cleopatra III; temporarily expelled from Alexandria by Cleopatra II between 131 BC and 127 BC, reconciled with her in 124 BC. Ptolemy XI Alexander II (80 BC) married and ruled jointly with Berenice III before murdering her; ruled alone for 19 days after that. Cleopatra VII Philopator (51–30 BC) ruled jointly with Ptolemy XIII Theos Philopator (51–47 BC), Ptolemy XIV (47–44 BC) and Ptolemy XV Caesarion (44–30 BC). Ptolemy Keraunos (died 279 BC) - eldest son of Ptolemy I Soter. Eventually became king of Macedon. Ptolemy Apion (died 96 BC) - son of Ptolemy VIII Physcon. Made king of Cyrenaica. Bequeathed Cyrenaica to Rome. Ptolemy Philadelphus (born 36 BC) - son of Mark Antony and Cleopatra VII. Ptolemy of Mauretania (died AD 40) - son of Juba II of Mauretania and Cleopatra Selene II, daughter of Cleopatra VII and Mark Antony. King of Mauretania. Members of the Ptolemaic dynasty were described as extremely obese. Their sculptures and coins show prominent eyes and swollen necks. Graves' disease within the family could explain the swollen necks and eye prominence (exophthalmos), although this is unlikely if they were simply obese. Members of this dynasty likely suffered from a multi-organ fibrotic condition such as Erdheim–Chester disease or a familial multifocal fibrosclerosis. With this condition, then thyroiditis, obesity and ocular proptosis can all occur at the same time. 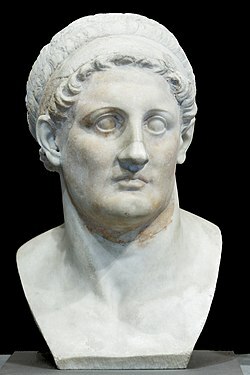 Ptolemy of Macedon founded the Ptolemaic Dynasty. Ptolemy XV, commonly called Caesarion. ↑ Jones, Prudence J. (2006). Cleopatra: A Sourcebook. University of Oklahoma Press. p. 14. They were members of the Ptolemaic dynasty of Macedonian Greeks, who ruled Egypt after the death of its conqueror, Alexander the Great. ↑ Pomeroy, Sarah B. (1990). Women in Hellenistic Egypt. Wayne State University Press. p. 16. while Ptolemaic Egypt was a monarchy with a Greek ruling class. ↑ Redford, Donald B., ed. (2000). The Oxford Encyclopedia of Ancient Egypt. Oxford University Press. Cleopatra VII was born to Ptolemy XII Auletes (80–57 BCE, ruled 55–51 BCE) and Cleopatra, both parents being Macedonian Greeks. ↑ Bard, Kathryn A., ed. (1999). Encyclopedia of the Archaeology of Ancient Egypt. Routledge. p. 488. Ptolemaic kings were still crowned at Memphis and the city was popularly regarded as the Egyptian rival to Alexandria, founded by the Macedonian Greeks. ↑ Ashrafian, Hutan (2005). "Familial proptosis and obesity in the Ptolemies". J. R. Soc. Med. 98 (2): 85–86. Wikimedia Commons has media related to Ptolemaic dynasty. This page was last changed on 9 January 2017, at 10:51.